Aruba (/əˈruːbə/ ə-ROO-bə; Dutch pronunciation: [aːˈrubaː]) is an island country in the southern Caribbean Sea, located about 1,600 kilometres (990 mi) west of the Lesser Antilles and 29 kilometres (18 mi) north of the coast of Venezuela. It measures 32 kilometres (20 mi) long from its northwestern to its southeastern end and 10 kilometres (6 mi) across at its widest point. Together with Bonaire and Curaçao, Aruba forms a group referred to as the ABC islands. Collectively, Aruba and the other Dutch islands in the Caribbean are often called the Netherlands Antilles or the "Dutch Caribbean". Aruba's first inhabitants are thought to have been Caquetíos Amerinds from the Arawak tribe, who migrated there from Venezuela to escape attacks by the Caribs. Fragments of the earliest known Indian settlements date back to 1000 AD. As sea currents made canoe travel to other Caribbean islands difficult, Caquetio culture remained more closely associated with that of mainland South America. Another governor appointed by Spain was Juan Martínez de Ampiés. A cédula real decreed in November 1525 gave Ampíes, factor of Española, the right to repopulate Aruba. In 1528, Ampíes was replaced by a representative of the House of Welser. The Netherlands statutes have applied to Aruba since 1629. [clarification needed] The Netherlands acquired Aruba in 1636. Since 1636, Aruba has been under Dutch administration, initially governed by Peter Stuyvesant, later appointed to New Amsterdam (New York City). Stuyvesant was on a special mission in Aruba in November and December 1642. The island was included under the Dutch West India Company (W.I.C.) administration, as "New Netherland and Curaçao," from 1648 to 1664. In 1667 the Dutch administration appointed an Irishman as "Commandeur" in Aruba. The Dutch took control 135 years after the Spanish, leaving the Arawaks to farm and graze livestock, and used the island as a source of meat for other Dutch possessions in the Caribbean. In August 1947, Aruba presented its first Staatsreglement (constitution), for Aruba's status aparte[disambiguation needed] as an autonomous state within the Kingdom of the Netherlands. By 1954, the Charter of the Kingdom of the Netherlands was established, providing a framework for relations between Aruba and the rest of the Kingdom. The hinterland of the island features some rolling hills, the best known of which are called Hooiberg at 165 meters (541 ft) and Mount Jamanota, the highest on the island at 188 meters (617 ft) above sea level. 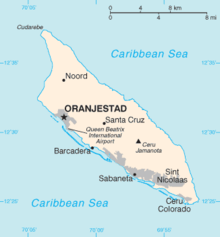 Oranjestad, the capital, is located at 12°19′N 70°1′W﻿ / ﻿12.317°N 70.017°W﻿ / 12.317; -70.017. The island, with a population of just over 100,000 inhabitants, does not have major cities. The island provides a habitat for the endemic Aruba Island Rattlesnake. In the Köppen climate classification, Aruba has a tropical semi-arid climate. Mean monthly temperature in Oranjestad varies little from 26.7 °C (80.1 °F) to 29.2 °C (84.6 °F), moderated by constant trade winds from the Atlantic Ocean, which comes from north-east. Yearly precipitation barely exceeds 470 mm (18.5 in) in Oranjestad. 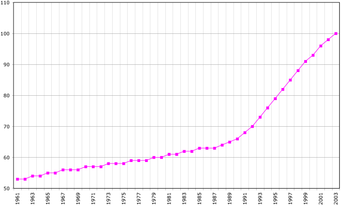 Population of Aruba 1961–2003, according to the FAO in 2005; number of inhabitants given in thousands. The population is estimated to be 80% mixed White/Caribbean native Americans, 5% Africans and 15% other ethnicities. The Arawak heritage is stronger on Aruba than on most Caribbean islands. Although no full-blooded Aboriginals remain, the features of the islanders clearly indicate their genetic Arawak heritage. Most of the population is descended from Caquetio Indians and Dutch and to a lesser extent of Africans,Spanish, Portuguese, English, French, Sephardic Jewish ancestors. Demographically, Aruba has felt the impact of its proximity to Venezuela. Many of Aruba's families are descended from Venezuelan immigrants. There is a seasonal increase of Venezuelans living in second homes. In recent years, the government of Aruba has shown an increased interest in acknowledging the cultural and historical importance of its native language. Although spoken Papiamento is fairly similar among the several Papiamento-speaking islands, there is a big difference in written Papiamento. The orthography differs per island and even per group of people. Some are more oriented towards Portuguese and use the equivalent spelling (e.g. "y" instead of "j"), where others are more oriented towards Dutch. The book The Buccaneers of America, first published in 1678, states through eyewitness account that the natives on Aruba spoke "Spanish". The oldest government official statement written in Papiamento dates from 1803. Around 12.6% of the population today speaks Spanish. Aruba has four newspapers published in Papiamento: Diario, Bon Dia, Solo di Pueblo and Awe Mainta; and three in English: Aruba Daily, Aruba Today and The News. Amigoe is a newspaper published in Dutch. Aruba also has 18 radio stations (two AM and 16 FM) and three local television stations (Telearuba, Aruba Broadcast Company and Channel 22). Parliament of Aruba in Oranjestad. 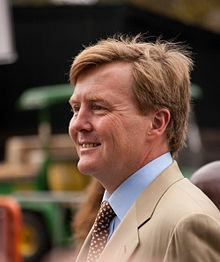 As a constituent country of the Kingdom of the Netherlands, Aruba's politics take place within a framework of a 21-member Parliament and an eight-member Cabinet. The governor of Aruba is appointed for a six-year term by the monarch, and the prime minister and deputy prime minister are elected by the Staten (or "Parlamento") for four-year terms. The Staten is made up of 21 members elected by direct, popular vote to serve a four-year term. Together with the Netherlands, the countries of Aruba, Curaçao and Sint Maarten form the Kingdom of the Netherlands. As they share the same Dutch citizenship, these four countries still also share the Dutch passport as the Kingdom of the Netherlands passport. As Aruba, Curaçao and Sint Maarten have small populations, the three countries had to limit immigration. To protect their population, they have the right to control the admission and expulsion of people from the Netherlands. The Aruban legal system is based on the Dutch model. Instead of juries or grand juries, in Aruba, legal jurisdiction lies with the Gerecht in Eerste Aanleg (Court of First Instance) on Aruba, the Gemeenschappelijk Hof van Justitie van Aruba, Curaçao, Sint Maarten en van Bonaire, Sint Eustatius en Saba (Joint Court of Justice of Aruba, Curaçao, Sint Maarten, and of Bonaire, Sint Eustatius and Saba) and the Hoge Raad der Nederlanden (Supreme Court of Justice of the Netherlands). The Korps Politie Aruba (Aruba Police Force) is the island's law enforcement agency and operates district precincts in Oranjestad, Noord, San Nicolaas, and Santa Cruz, where it is headquartered. There are two medical schools Aureus University School of Medicine and Xavier University School of Medicine. as well as its own national university, the University of Aruba. The GDP per capita for Aruba was estimated to be $28,924 in 2014; among the highest in the Caribbean and the Americas. Its main trading partners are Venezuela, the United States and the Netherlands. The island's economy has been dominated by three main industries: tourism, aloe export, and petroleum refining (The Lago Oil and Transport Company and the Arend Petroleum Maatschappij Shell Co.). Before the "Status Aparte" (a separate completely autonomous country/state within the Kingdom), oil processing was the dominant industry in Aruba despite expansion of the tourism sector. Today, the influence of the oil processing business is minimal. The size of the agriculture and manufacturing sectors also remains minimal. The official exchange rate of the Aruban florin is pegged to the US dollar at 1.79 florins to 1 USD. Because of this fact, and due to a large number of American tourists, many businesses operate using US dollars instead of florins, especially in the hotel and resort districts. About three quarters of the Aruban gross national product is earned through tourism or related activities. Most tourists are from the United States (predominantly from the north-east US), the Netherlands and South-America, mainly Venezuela and Colombia. As part of the Kingdom of the Netherlands, citizens of (mainland) the Netherlands can travel with relative ease to Aruba and other islands of the Dutch Antilles. No visas are needed for Dutch citizens, only a passport, and although the currency used in Aruba is different (the Netherlands has the Euro), Euros are still not widely accepted but can be easily exchanged at a local bank for Aruban Florins. In 1999, the U.S. Department of Defense established a Forward Operating Location (FOL) at the airport. There is also a small Dutch marines base by Savaneta containing approximately 120 Dutch Marines and about 100 AruMil forces. Ornate buildings in Oranjestad, Aruba. Iguanas on a rooftop in Aruba. Christmas and New Year's Eve are celebrated with the typical music and songs for gaitas for Christmas and the Dande[clarification needed] for New Year, and "ayaca", "ponche crema", ham, and other typical foods and drinks. Millions of florins worth of fireworks are burnt at midnight on New Year's Eve. On 25 January, Betico Croes' birthday is celebrated. Dia di San Juan is celebrated on June 24. Aruba has two ports, Barcadera and Playa, which are located in Oranjestad. The Port of Playa services all the cruise-ship lines, including Royal Caribbean, Carnival Cruise Lines, NCL, Holland America Line, Disney Cruise Line and others. Nearly one million tourists enter this port per year. Aruba Ports Authority, owned and operated by the Aruban government, runs these seaports. Arubus is a government-owned bus company. Its buses operate from 3:30 a.m. until 12:30 a.m. 365 days a year. Small private vans also provide transportation services in certain areas such Hotel Area, San Nicolaas, Santa Cruz and Noord. Water-en Energiebedrijf Aruba, N.V. (W.E.B.) produces potable industrial water at the world's third largest desalination plant. 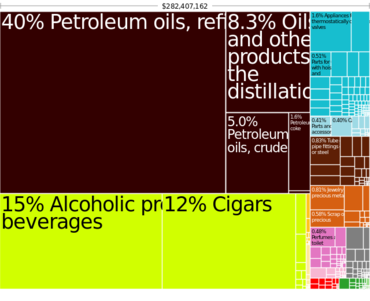 Average daily consumption in Aruba is about 37,000 long tons (38,000 t). There are three telecommunications providers: Setar, a government-based company, Mio Wireless and Digicel, both of which are privately owned. Setar is the provider of services such as internet, video conferencing, GSM wireless technology and land lines. Digicel is Setar's competitor in wireless technology using the GSM platform, and Mio Wireless provides wireless technology and services using CDMA. ^ a b "Aruba". Encyclopedia Britannica. Retrieved 2014-08-10. ^ Robbers, Gerhard (2007). Encyclopedia of World Constitutions 1. New York City: Facts on File, Inc. p. 649. ISBN 0-8160-6078-9. ^ "BBC News — Aruba profile — Timeline". Bbc.co.uk. 2013-11-05. Retrieved 2014-07-15. ^ a b Canoe inc. (2011-06-22). "Aruba: the happy island". Slam.canoe.ca. Retrieved 2014-07-15. ^ a b Central Intelligence Agency (2009). "Aruba". The World Factbook. Archived from the original on 4 June 2011. Retrieved 2011-06-06. ^ "Political Stability". Aruba Department of Foreign Affairs. Retrieved 2011-06-07. ^ "EU Relations with Aruba". European Union. Archived from the original on 9 June 2011. Retrieved 2011-06-06. ^ "Overseas Countries and Territories (OCT)". European Union. Retrieved 2011-06-06. ^ "Korps Politie Aruba: district precincts". Aruba Police Force. Retrieved 2010-09-11. ^ Central Bureau of Statistics. "Key Indicators General Government, 1997–2006". Retrieved 2011-06-07. ^ "Bogaerts: USA TODAY Sports' Minor League Player of Year". Usatoday.com. 2013-09-03. Retrieved 2014-07-15. ^ "Convert Dollars to Aruba Florin | USD to AWG Currency Converter". Currency.me.uk. Retrieved 2014-07-15. ^ "Convert United States Dollar to Aruban Florin | USD to AWG Currency Converter". Themoneyconverter.com. Retrieved 2014-07-15. ^ "Aruba Hosts International Desalination Conference 2007". Aruba Tourism Authority. July 18, 2007. Archived from the original on February 15, 2013. Retrieved May 13, 2015. ^ "History". W.E.B. Aruba NV. Archived from the original on 18 July 2011. Retrieved 2011-06-07. ^ "Mio Wireless Products". Mio Wireless. Retrieved 2014-08-25. ^ "Coral bridge, natural Aruba tourist spot, collapses". USA Today. Associated Press. 2 September 2005. Retrieved 2010-09-11. This page was last modified on 6 September 2015, at 18:34.